One of the assumptions I hear from business owners every day is that individual business relationships are old-fashioned and outdated…a romantic notion left over from the pre-digital era. The feeling is that A) today it’s all about getting noticed and positioning yourself with the best keywords, and B) this trend will only grow in the future. If you are operating your business based on these notions, beware: You could be heading in the wrong direction. There is evidence that, despite the fact that the world is increasingly digitized, personal business relationships are going to grow in importance over the next 20 years. To begin with, there is a generational change taking place in the U.S. workforce. Millennials are moving into the mainstream of business and will make up as much as 85 percent of American workers in the next 10 years. This means it’s becoming increasingly likely that you will be selling your business products and services to millennial buyers. And guess what millennials value more than the generations that preceded them? Yes, relationships. Competence – Do you get results? How capable are you? Character – What is your intent and level of integrity? Connection – Are you able to communicate and build relationships? 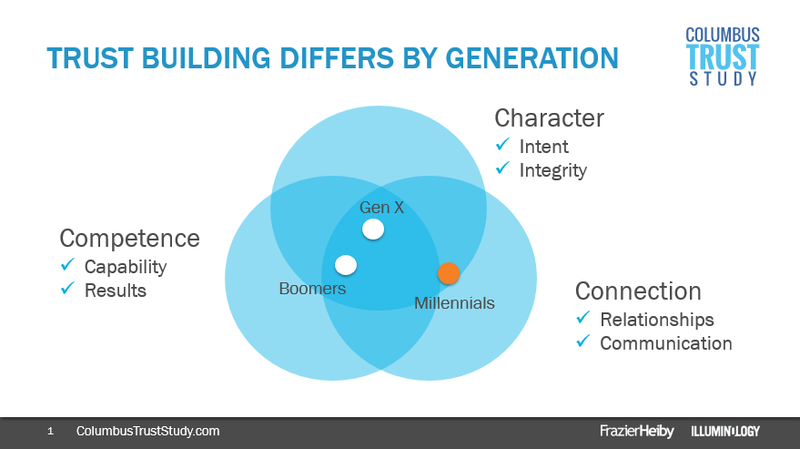 What I found most illuminating about the study was that each generation values the three C’s in different proportions. As you can see from the slide below, baby boomers are more focused on Competence—whether a business can deliver the results. Getting the job done is the most important element of trust for boomers. Gen X, however, is more oriented toward Character. Honesty and integrity matter more to Gen Xers than to other workers. Millennials were different as well, with more focus on Connection than the other groups—a lot more focus! From a marketing perspective this is a tectonic shift, because it requires a change in focus away from mass marketing and toward personal, individual marketing. For baby boomers, you can put out case studies that prove you deliver on time and on budget. For Gen Xers, you can showcase your company values of honesty and integrity. But, millennials are a whole different challenge. They don’t want to know about you. They want you to know about them. In Clicksand, I talk about the “Missing Model” of 1-to-1 (the marketing approach that most marketers don’t talk to clients about). 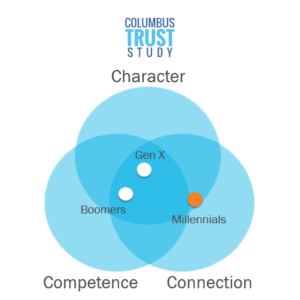 The Columbus Trust Study is yet another confirmation that businesses must incorporate the 1-to-1 model into their marketing approach—finding ways to treat valuable customers as unique individuals. As millennials wield more and more influence in the business world, the ability to make those personal connections will mean the difference between success and failure. And the last time I checked, success in business is something every generation values.